This black ball chair is the perfect alternative to traditional chairs, offering you the benefits of an exercise fitness ball and an easy rolling base. 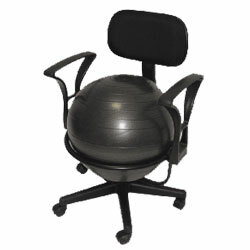 It promotes active sitting while strengthening the back and improving posture. And, since it's lightweight and easy to transport, you can enjoy it anywhere. Plus, the roller base makes it extra easy to move from room to room. 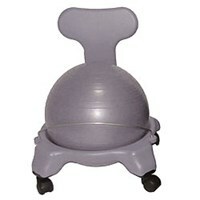 It's so comfortable, you may never sit in a traditional chair again Includes a ball and hand pump. Easy assembly required. Measures 23 x 23 x 7(unassembled) . Weighs 30 lbs. Black. Steel frame. Add $30 S/H.